When it comes to the best hiking shoes for women with flat feet, there are certain features that you should look for. After all, flat-footed women will need more support on the heels, along with ample cushioning. Thus, it is important to consider buying shoes that have firm cushioning and maximum support in all areas such as the heels and arch. Heel support is also necessary to prevent discomfort, and the midsole must be firm enough not to bend with every step. The medial side foot must be properly supported, particularly among those who suffer from overpronation. To determine if overpronation is an issue, you can check the shoe’s bottom portion. If you notice that the inner side is more worn out than the other parts, then overpronation needs to be addressed. Also, it will help to consult your podiatrist to know your gait. Another option is by going to your local shoe store and asking a specialist to evaluate your gait. This way, you can find a suitable pair of shoes for your particular needs. Below are among the top-rated hiking shoes for women with flat feet. Read along to learn more about the best features and benefits of each. The following are among the top-rated sandals that you can choose from when you want to buy a high-quality pair of footwear for your outdoors trip. To make things much simpler for you, here are different brands of hiking shoes that may be worth your investment. 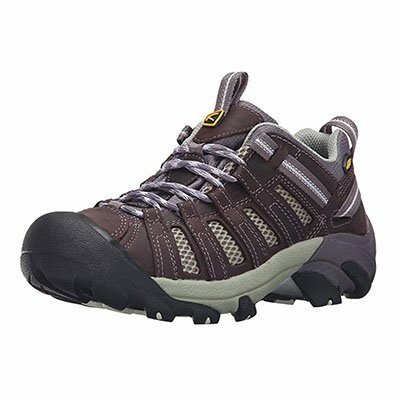 This model of hiking shoes is recommended for flat-footed women who suffer from overpronation. You can count on experiencing maximum support, thanks to the dual-density EVA component for the footbed and the nylon shank integrated right into the midsole. These features offer real support for the midfoot and arch, as well as torsional rigidity. So, if you have flat feet, you will not feel much exhaustion or discomfort with each step during the hike. These shoes are lightweight and waterproof, which add to your comfort whenever you go on a nature walk trail or outdoors activity. As for the outsole, you can rely on the maximum traction offered by these shoes. You can certainly go on an enjoyable hike no matter what the weather condition is. Also, there is a breathable mesh for the upper along with waterproof leather material for the overlays. These provide the best support you need while keeping your feet dry, cool and fresh for hours. Other brilliant features of these shoes include the Numentum Hike technology, which provides stability and neutral positioning. There is a TPU heel clip on the lateral and medial parts to deliver these benefits. Moreover, these shoes have a gusseted tongue that prevents dirt and debris from getting into the shoe. For additional protection, there is a rubber toe component to prevent injuries and pains on your toes with each step. The same benefit is provided by the shock dispersal plate located in the forefoot area. Do you have flat feet, and you find it hard to walk and go on a hike with your regular shoes? 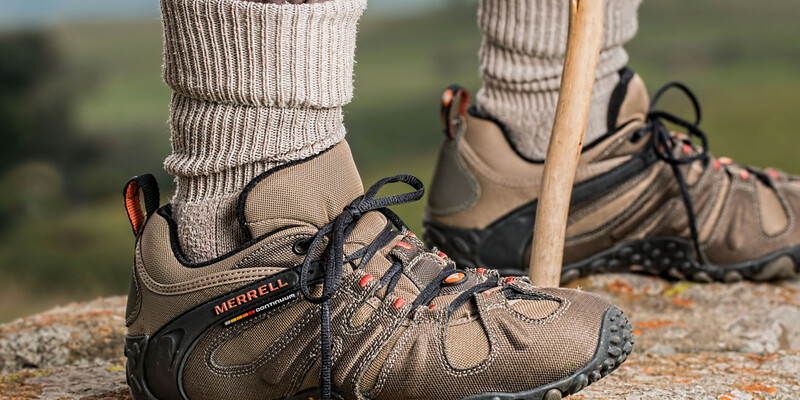 If so, then it may be worth checking out these waterproof hiking shoes by Merrell. The Moab hiking shoe is waterproof and comfortable, and you will find it ideal to wear these shoes when you have overpronation or flat feet. It comes with every single feature and component that aids to your needs for a comfortable and supportive pair of shoes. For enhanced comfort, these shoes have the Qform comfort midsole, which is unique with Merrell footwear. This feature delivers ample cushioning with every gait cycle and stride. What’s more, air cushion is incorporated in the heel to maintain stability while absorbing shock. This is important since you may come across different surfaces when you go on a hiking trip. There is a molded nylon shank to provide medial stability, and this controls overpronation concerns. The insole is made of molded foam, and the M-Select Dry technology keeps your feet shielded from external elements such as heat or moisture. The interior is also breathable, and this is quite essential since the last thing you want is to wear these shoes and suffer from sweat or wetness that can be very uncomfortable and non-hygienic at the same time. As for additional components that ensure your comfort with these shoes include the padded collar and tongue, heel pull loop and a fabric lining for enhanced breathability. For a comfortable fit, these shoes have a traditional lace-up type of closure so that you can adjust the tightness of the shoe well. When you look for hiking shoes that you can wear not only during your trail adventure but also during your workout routines, then this product is for you. These shoes help support your feet on all areas, which is great for those who need to walk around for hours. You will like how it comes with breathable features such as the mesh that provides ample ventilation, rubber compound for the midsole and anatomical footbed to protect your feet from injury while maintaining stability. 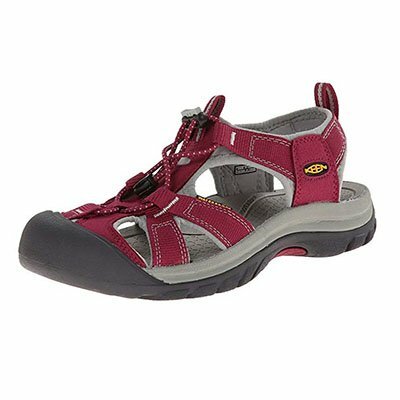 To complete this list of the finest hiking shoes for women who have flat feet, the Keen Voyageur is an excellent choice. This is quite similar to what you can expect from the Targhee II, except for additional ventilation for superb breathability. There is a leather upper with waterproof mesh webbing, and this keeps your feet dry at all times. The midsole has a compression molded dual-density EVA. This provides added support for the arch, which is important for flat-footed individuals. For optimum comfort to your toes, the toe box is wide and roomy. You can also remove the footbed for your custom orthotics, in case you need more protection. With a good support structure for the heels and ESS shank, your every step is secure and stable. Since these shoes have a wider width and roomy toe box, even people with plantar fasciitis will find it comfortable to go on hikes with this footwear. Durable, lightweight and supportive, you can never go wrong with these hiking shoes by KEEN. 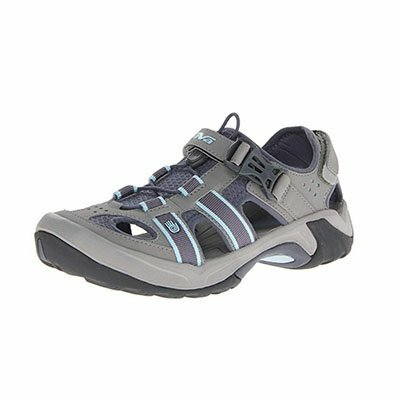 Whether you are looking to have a day adventure on the beach or an extended trip to the mountains, these hiking shoes for women by KEEN is a brilliant choice. It offers an exquisite mix of versatility and fashion, so it is one product that you will want to wear even when you are at the gym or just walking your dog in your neighborhood. With leather eyelets and a smart lacing system to ensure you of a good fit, as well as climate control built-in the shoe, this product is your best option when you need the right pair of shoes for any weather. When you want to buy a pair for yourself, make sure you purchase one that is a half size larger to get the right fit you need. The Arroyo II offers you the best of both worlds as it features an exceptional combination of a sandal and trail shoe in one. One of the most stunning features of this footwear is its open vents for enhanced breathability and comfort for hours. For your convenience, it comes with a toggle lace closure, which gives you a secure fit. The removable footwear has a unique AEGIS microbe shield treatment, a brilliant technology that maintains freshness the freshness and comfort of your feet. Keep in mind that these sandals are about one-half size longer than your regular footwear. Thus, it is ideal to buy a pair that is a half-size smaller to ensure you of a perfect fit. This brand of hiking sandals is synonymous for superior comfort and durability, so you can expect to have the best value for your money without sacrificing style. Since it features both qualities of a sandal and shoe, you will love its superb breathability while providing the best protection on your feet as regular shoes offer. You will also like how these shoes have that molded EVA material for the midsole and cushioned heel for shock absorption purposes. With the water-resistant quality of these sandals, this serves as the perfect footwear for land-based and water activities such as hiking, river rafting or kayaking. With a unique strapping system, breathable quality and washable exterior, this brand of hiking sandals for women are the finest options for individuals who lead and active lifestyle. 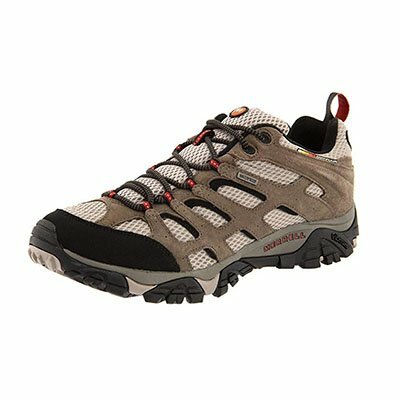 You can use it on your hiking trip and experience superb comfort in every step with its significant traction control and a grippy outsole. When the weather is dry and warm, these sandals also prove to be an excellent choice to wear. Its non-marking rubber sole can handle any terrain surfaces and the V-strap design on the forefoot helps maintain your stability even when you need to walk on a wet surface. Most people prefer to use walking sandals instead of boots or slippers because of the superior ventilation and lightweight quality that sandals offer. You will also like the fact that these come with straps for optimum fit, so there is no risk of these sandals coming off as you step – unless you choose to remove the footwear. When you want to boost your chances of buying the right pair of sandals, then these tips can help you get started. The main reason they are called sandals is because of the heel strap that serves as a closure to the footwear. You can find brands with a velcro or hook and loop type of closure. Be sure to choose sandals with several closures for optimum support, which is important when you are on a hiking trip. If you are going to the beach, fields, or any flat terrain, you may want to buy sandals with removable straps. This feature lets you convert the sandals into slippers or slip-on style of footwear for your convenience. For optimum comfort, it is best to buy sandals that have a cushioned footbed. There are different materials used for the padding such as compression-molded EVA or Vibram, to name a few. Such type of material helps absorb shock and impact while maintaining your stability with each step. You may also want to look for footbeds that are deep enough to help your feet relax and sink with ease. For your ultimate comfort, choose footbeds made of a moisture-wicking material to keep your feet dry and cool all the time. Naturally, you would not want to overspend on a pair of walking sandals when your budget is a bit tight. Just find the basics you need and make sure the footwear is durable enough to withstand harsh weather conditions while ensuring your comfort in every step. So, you’re planning to go on a hiking trip, and you’ve got everything ready except for a good pair of shoes to wear for your outdoors adventure. When it comes to the best hiking shoes to buy, what proves to be your best option? What are the best materials to look for, and how can you be sure that the features available in a particular brand or model is good enough for your needs? To help you choose the best hiking shoes for women, this comprehensive guide can be an excellent resource for you. Aside from shopping tips, above you can find short reviews of the top 5 brands of hiking shoes that are worth considering when you search for quality and practicality in a pair of footwear for hiking. When selecting the best hiking boots, it all comes down to your preferences. Ideally, your shoes should blend perfectly with your hiking options. If you assume that your trip will last for days, and you’re likely to be walking around rocky paths, then be sure to look for high or mid-high cut boots for the total comfort of your feet. If you are only opting for a short hike that last for at least 12 hours (or maybe even less), low-cut shoes with the same protective midsoles and footbed are your best bet. Most importantly, you should buy shoes that are not too loose or too tight on you. There should be ultimate comfort with every move you make, and the soles must provide protection to your feet even with a rough terrain that you need to pass by. By determining the type of shoes and how they fit on you, you will have no regrets about investing on such item. Which Type of Shoes to Buy? Now, it’s time to think about the type of shoes that you can find in stores as you search for the right pair of hiking shoes. Basically, there are a few options to find such as low-cut or light hiking shoes, mid-cut and high-cut. 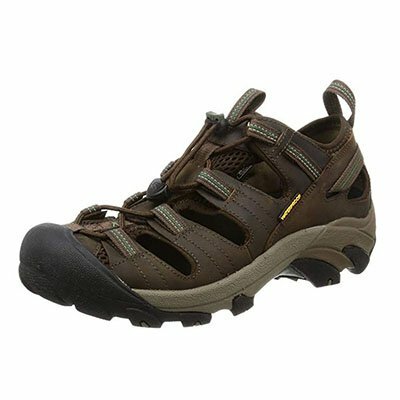 If you are planning to hike for only a few hours or during the day, then a low-cut hiking shoe will be perfect. These are also perfect when you are only traveling light, and you don’t prefer to wear beefy shoes that weigh more than one pound. Although this type of footwear is comfortable and lightweight, you may have to put up with mud or sand getting into your foot because of its low cut. 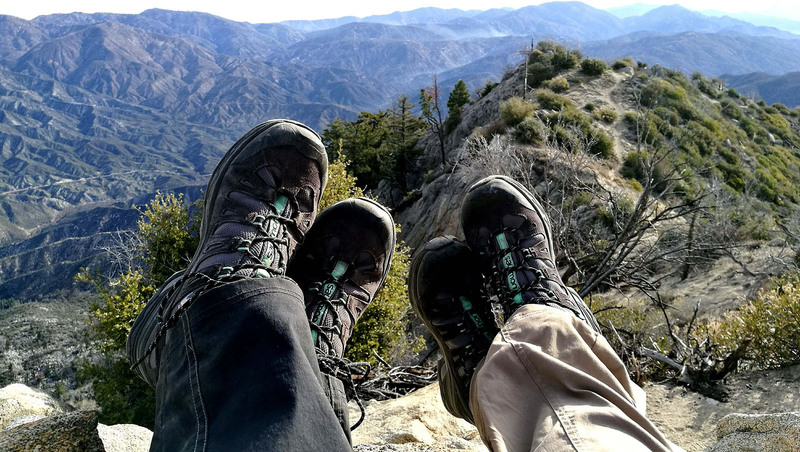 For longer hours of hiking such as a weekend trip, mid-cut hiking boots are often preferred by many hikers. Since they cling snugly to your ankles, this type of footwear offers some kind of protection from sand or grit invading the interior of your shoes. Most travelers choose this type of shoes when they need to carry moderate loads and want better protection from dirt than what low-cut shoes can offer. However, if you are up for intense and tough hiking trips, then by all means go for high cut mountaineering boots. Nothing can get much better than these boots that let you go the distance whether you are traveling with heavy loads or embarking on a wild glacier travel. Since these boots are tough and durable, you can expect them to provide ultimate support on your ankles and feet regardless of the tough terrain or trails. When you anticipate heavy loads that must be brought during the trip, then you should certainly opt for this type. Just be sure to get your feet used to these boots prior to the trip, so your feet can get used to the feeling of being inside your shoes. As you search for the best pair of shoes, you will realize that the materials also have a direct impact to the durability of your shoes. When it comes to the upper portion of the boot, the material is often breathable, water-resistant and durable. These features provide you the kind of comfort and ease you look for it a good pair of boots. Full-grain leather is your best bet in terms of the materials used in the boot. Not only does the material look elegant, but it is superbly durable, as well. In fact, this type of leather is usually recommended when you are on an extended trip, particularly on tough and rugged terrains. A word of caution, though – full-grain leather is not that breathable as other types of leather such as those combined with nylon material. These boots also require some time for break-in, so you should consider buying these boots weeks ahead to give your feet a few days to get used to these shoes. Another option to full-grain will be nubuck, which has some similarities with suede. The material is durable and capable of resisting abrasion for rough terrains. Just be sure to allot some time to make your feet more comfortable in these boots. When you want something breathable and comfortable to wear, then you should opt for the split-grain leather. The concept behind this is that it offers a combination of nylon and leather, specifically with nylon mesh on the inside and leather on the exterior. This is the right choice to buy when you are on a budget. 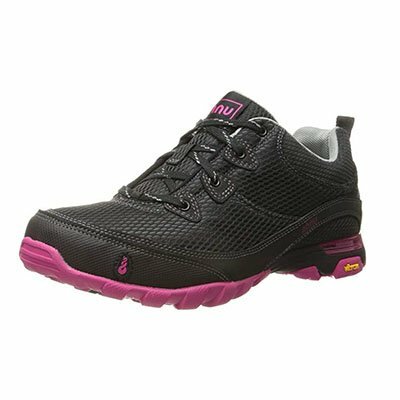 Look for models with waterproof nylon liners to keep your feet dry throughout your hike. The cheapest of all would be boots made of synthetic material. Naturally, you can expect these to be much lighter, as compared to genuine leather. Thus, they also cost less, but these boots can hardly resist wear and tear. After a few uses, you may notice signs of wear on the stitching outside of the shoe. Even if you decide to buy waterproof boots, you should make it a point to keep them well-maintained. You may purchase waterproofing product that can prevent dirt from destroying the quality of the lining on your shoes. This also adds to the durability of the entire footwear, so you can expect your shoes to last for years. Since these shoes are made for hiking and other outdoors adventure, you need to make sure that they offer ample support to your feet. For instance, look for inserts that are thick enough to serve as an excellent shock absorber without causing you any discomfort because of the thickness of these inserts in the midsole. As for the outsoles, the usual material used is rubber, although there are some extra components added such as carbon to ensure the firmness, stability, and hardness of the soles. In addition to the material, check the lug pattern that adds to the excellent traction of your boots. If you require a tougher grip for mountaineering, then you should go for boots with deeper lugs. When you want better traction on muddy or sandy areas, lugs that are widely spaced are more suitable. How Well Do Your Shoes Fit? To ensure your comfort, you should look for shoes that offer an excellent fit. But, how exactly can you determine the right fit on your feet? Simple – by measuring the 3 important areas of your foot and taking all these details into consideration as you shop for hiking boots. For the width, make sure that your feet are secure on the footbed without sliding around or feeling compressed on both sides. Check your toes when you wear the shoes, and be sure that they can still wiggle a bit even with your boots on. Lastly, check how well the greater portion of your foot fit inside your shoes. As you walk while with your boots on, your feet should fit in comfortably and relaxed inside instead of cramped and in pain. Hiking is a fun and rewarding activity that you can spend with the whole family or your friends. There are so many spectacular places to explore, which can give you a better perspective of the world around you. The beauty of nature and joy of being with the ones you love during the trip are among the reasons why hiking appeals to several people of all walks of life. However, before you head off to your hiking trip, you should keep your feet protected with the right pair of shoes. You need to consider the level of comfort and support that you get from the shoes you wear to avoid any injuries or pains throughout the hike. By choosing these best hiking shoes for women with flat feet, you should have the time of your life exploring amazing places and sights without a hint of pain or discomfort with each step.